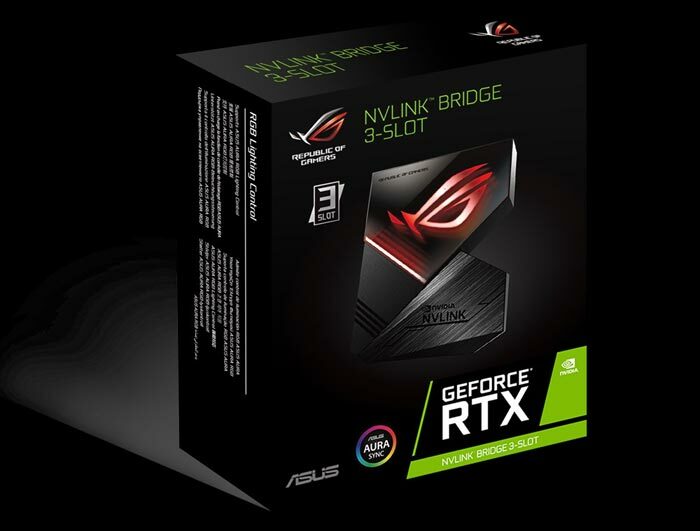 Nvidia was, until recently, the only seller of NVLink bridge devices, as used to join up multiple RTX 20 Series graphics cards. Its own branded bridge solution, which supports the new GeForce RTX 2080 Ti and RTX 2080 graphics cards, is available in 3-slot and 4-slot configurations and priced at £75.99 here in the UK. 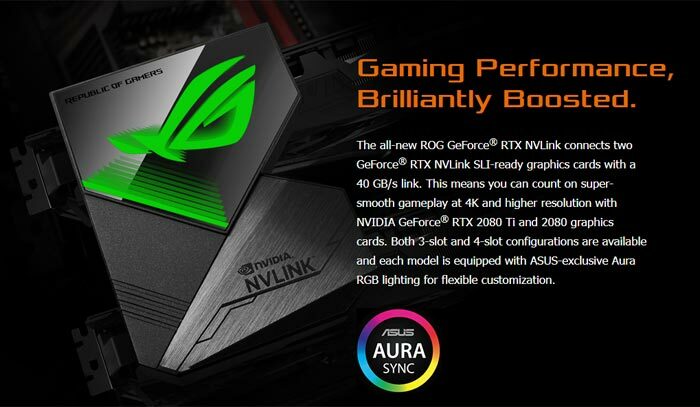 Now Asus ROG has a competitor device out which is compatible with all RTX 2080 Ti and RTX 2080 graphics cards but a "perfect fit" with the Asus ROG Strix, Dual, and Turbo series. 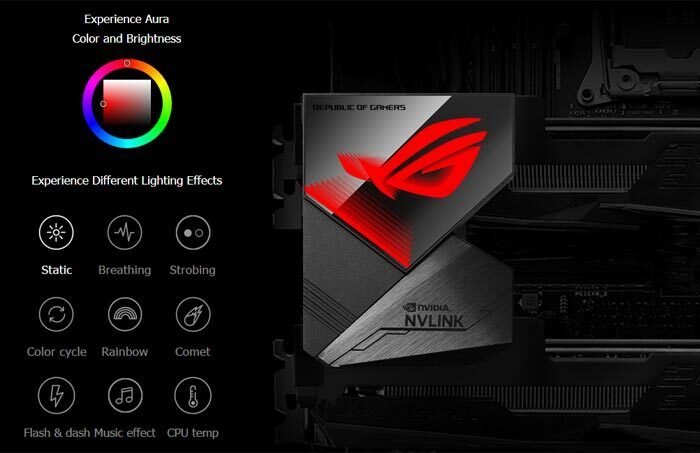 The new ROG-NVLink is now detailed on the official Asus web site. The key reasons why you might choose this Asus alternative are if you like Asus ROG branding, if it perhaps matches other Asus ROG components in your PC, and you like your components to offer configurable RGB LED lighting. Like the Nvidia branded product the Asus ROG GeForce RTX NVLink comes in 3-slot and 4-slot configurations to fit your system. See the illustration below as an explanation and to see why there is no '2-slot' solution. The move to NVLink with the RTX 20 Series graphics cards was seen as necessary as the older SLI-technology was creaking under the strain with the previous generation of Nvidia graphics cards. Nvidia and Asus boast that the new connector interface offers "50X the transfer bandwidth of previous technologies enables extreme resolutions and refresh rates". As spelled out above, Asus ROG's current USP (before the likes of MSI and Gigabyte / Auorus and others arrive) is the configurable RGB LED lighting. Of course, Asus installs its own Aura RGB LED lighting system. The product page doesn't detail how many LEDs or zones there are in this product. Asus hasn't revealed pricing and availability but a quick search found the triple slot version of the ROG-NVLink for sale via CaseKing in Germany for € 89.90, a lot more expensive than the older RGB LED SLI bridges from Asus ROG, Aorus or MSI. Being rather generous with that definition…! As per thread title, this is about an Asus product… with the only quoted price coming from a retailer anyway.